If Obama is going to do something important in the Middle East, this administration will have to bring Syria to center stage. To do so it will have to press Israel to part with the Golan even though Uzi Arad, a Netanyahu aide said recently that “Israel needs to retain part of the Golan “for strategic, military and settlement reasons. For water, landscape and wine.” Syria way be weak militarily but it holds many regional cards. Most importantly, it speaks for Arab opinion in condemning Washington for being two-faced in its claim to be on the side of justice and law. If Washington is going to make a good faith effort to restrain Israel’s territorial acquisitiveness, it should not be signing an agreement to sell 75 new US F-35 fighters to Israel, at least not yet. Israel’s superior air power convinced Olmert that he could kill Israel’s enemies rather than negotiate with them. Further increasing Israel’s military superiority will not diminish this bad habit. Equally, the Obama administration should not be pressing the “IAEA to…. push for special inspections in Syria,” at least not yet. (See this article about how the US is offering the IAEA an 8% increase in money if it presses the Syria case, among other things.) Washington seems blind to the fact that its efforts to improve Israel’s military might while chipping away at its rivals makes Israel impervious to entreaties that it fulfill international law. One the one hand, Washington claims it has no means to make Israel give up the Golan, and on the other, it doesn’t even try. “The Saudis want to persuade Iran’s erstwhile allies, notably Syria, that Teheran is a weak regime,” says one veteran analyst. Another notes, “The uprising has killed the myth of Iran stability.” One problem with this approach, say US officials, is that, in the case of Syria, the Saudi outreach may come at a price that the US is not happy to see paid. Specifically, they worry that the Saudis will reduce their support for their allies in the Lebanese government in order to attract Syria. Already, their protege, Saad Hariri, has seen Saudi support for a more independent Lebanese stance towards Syria dissipate. Or as one US official put it last week, “The Saudis may be willing to sell out Lebanon for Arab unity against Iran.” [US officials say they have remonstrated with the Saudis about this, but so far to little effect]. Israel’s plans to buy US F-35 fighters indicate its desire to be able to penetrate the Russian air defense systems Iran and Syria are set to receive, a report says. F-35 fighter aircraft can make the S-300 air defense systems ineffective, as computer simulations have shown that the new US stealth fighters outperform Russian missiles, Ria Novosti cited officials in Tel Aviv as saying….. The final price for the model, estimated at over $100 million, and technical details of the deal still remain to be determined however….. Predictions are that the final contract will be signed in early 2010 with the US promising to deliver a third of the 75 estimated F-35 fighters to Israel by 2014…. LONDON (AFP) — US President Barack Obama said he was troubled by Syria’s behaviour but hoped for progress in ties with former foe Damascus, in an interview to be screened Sunday. Obama was asked by Britain’s Sky News television if he would accept an invitation to go to Damascus for face-to-face talks with Syrian President Bashar al-Assad. “We’ve started to see some diplomatic contacts between the United States and Syria,” Obama said, in an interview recorded during Saturday’s visit to Ghana. “There are aspects of Syrian behaviour that trouble us and we think that there is a way that Syria can be much more constructive on a whole host of these issues. Assad said earlier this month that he would be willing to meet Obama in Syria to discuss Middle East issues. “We would like to welcome him in Syria, definitely. I am very clear about this,” he told Sky News. I quoted approvingly today from a Jim Hoagland column that I thought got a couple of the big things right on Obama’s foreign policy: The unified front of principals, and the policy-making White House core. Surprised to see the news the other day that the Obama administration is sending an ambassador back to Syria? So was Hillary Clinton’s State Department. Officials there were still negotiating with Damascus to win some movement on Middle East issues when President Obama’s decision was leaked. That really doesn’t match the account I’ve gotten. I’m told the recommendation came in a memo from Mitchell to Clinton and Obama after his mid-June meeting with Syrian President Assad. The decision was discussed in a Deputies Committee that included the powerful Deputy Secretary of State, Jim Steinberg as well as a Mitchell aide, Fred Hoff. Clinton’s personal staff on the seventh floor was aware of the recommendation before it was announced, as was the Acting Assistant Secretary of State for Near East Affairs, Jeffrey Feltman. Hoagland’s column suggests that others in Foggy Bottom were taken aback, but both Clinton and Mitchell — the central negotiator on the ground in the Middle East — were in the loop on this one. ….. For decades Syria has doggedly insisted that the underlying situation can be solved only with a comprehensive regional peace agreement that sees it regain the Golan Heights. Regardless of American or Saudi ambassadors being posted to Damascus, or efforts to weaken the Syrian-Iranian alliance, if that does not happen, any new chapter is doomed to have the same old ending. The [Israeli] Foreign Ministry unveiled a new plan this week: Paying talkbackers to post pro-Israel responses on websites worldwide. A total of NIS 600,000 (roughly $150,000) will be earmarked to the establishment of an “Internet warfare” squad. A 116 page secret manual used to school American Jewish leaders in how to effectively discuss Israel has been leaked to Newsweek. How do you sell the American public on the idea that Israel has the right to maintain or even expand Jewish settlements in the West Bank? Be positive. Turn the issue away from settlements and toward peace. Invoke ethnic cleansing. Those are three of the recommendations made by Frank Luntz, a political consultant and pollster, in an internal study he wrote for the Washington-based group The Israel Project (TIP) on effective ways to talk to Americans about the conflict between Israelis and Palestinians. 10) Draw direct parallels between Israel and America—including the need to defend against terrorism. 12) No matter what you are asked, bridge to a productive pro-Israel message. When asked a direct question, you don’t have to answer it directly. You are in control of what you say and how you say it. 13) Talk about the future, not the past. 15) Use rhetorical questions. Avoid head on attacks of your opponents. Use a soft tone. Show regret that the Palestinians have been led so poorly. 17) K.I.S.S. and tell and tell again and again. A key rule of successful communications is “Keep It Simple, Stupid”. Successful communications is not about being able to recite every fact from the long history of the Arab-Israeli conflict. It is about pointing out a few core principles of shared values—such as democracy and freedom—and repeating them over and over again. 18) Avoid “analysis paralysis” and be pro-active. 22) Never, never, NEVER speak in declarative statements. Never. • “Living together, side by side. This is the best way to describe the ultimate vision of a two-state solution without using the phrase. That said, it is important to note that there are effective ways to uphold the ultimate goal of a Palestinian self-government while legitimately questioning how soon the solution can be reached. This is the rhetorical area in which you need to operate. 5) The fight is over IDEOLOGY – not land; terror, not territory. Thus, you must avoid using Israel’s religious claims to land as a reason why Israel should not give up land. Such claims only make Israel look extremist to people who are not religious Christians or Jews. Note also the use of Arab nations to marginalize Iran. Just as we recommend in the chapter about Hamas, there is immense value in isolating Iran’s leadership as being out of step with Arab neighbors. Many Americans would be surprised to know that these nations are afraid of Iran, just like Israel. By surprising them, you open their minds to the rest of your message. 1) Talk about “a willingness to negotiate” and “Camp David” in the same sentence. 4) The settlements are necessary for the security of Israel. An aide to Israel’s prime minister has said Israel must keep a large part of the Golan Heights, rejecting Syria’s major demand for a peace deal. The previous government held indirect talks with Syria, assumed to be based on returning the Golan Heights, occupied in 1967, in return for peace. In June, Syrian President Bashar Assad said there was no partner for talks on the Israeli side. Correspondents say the aide’s comments will serve to reinforce this view. Syria has remained in a state of war with Israel since its 1948 foundation. 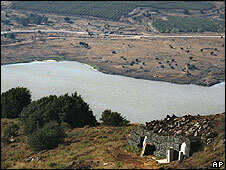 Israel took control of the Golan Heights, a strategic mountainous area now popular with Israeli holidaymakers, during the 1967 Six Day War. The comments come amid a thaw in relations between the US and Syria. US President Barack Obama has sent envoys on a series of visits, and Mr Assad recently invited the US president himself to Damascus. US Middle East envoy George Mitchell recently visited Syria and said Damascus had an “integral role” in finding peace in the region. But the government of Israeli Prime Minister Benjamin Netanyahu stands to the right of his predecessor, Ehud Olmert. Correspondents say the new government’s emerging position makes an Israeli-Syrian deal look unlikely. “The position is that, if there is a territorial compromise, it is one that still leaves Israel on the Golan Heights and deep into the Golan Heights,” the aide, Uzi Arad, said in an interview with Israeli newspaper Haaretz. He said the Israeli government was willing to resume negotiations with “no prior conditions”, but Israeli control of parts of the territory was necessary for “strategic, military and land-settlement reasons… needs of water, wine and landscape”. Syria wants the entire territory back. The Golan Heights is currently home to about 18,000 Israeli settlers and another 17,000 Druze Arabs loyal to Syria. There “could be worse” leaders than Palestinian President Mahmoud Abbas, Arad said. “But even with him I don’t see a real interest and desire to arrive at the end of the conflict with Israel. On the contrary. He is preserving eternal claims against us and inflaming them,” he said. The recent gesture by the Obama administration to re-open the U.S. embassy in Damascus and renew talks with the Syrian government was meant to lay the groundwork for a resumption of Israeli-Syrian talks under American auspices. There is indeed a window of opportunity for Israel to make peace with another Arab country, which if achieved, would ultimately bring peace to the whole region. Syria indeed has more to offer Israel than any other country in the region. The Syrians have the Golan Heights issue, in which it is supported by the international community. Syria borders Iraq and could have a significant impact on Iraq’s future. Syria has major influence in Lebanese politics, to Israel’s dismay. They carry the Hamas and Hizbullah cards in their hand and enjoy the alliance with Iran, which annoys and disturbs Israel. Therefore, Syria is the nearest and strongest enemy of Israel; you cannot rule them out. Syria can offer everything and nothing. It has a lot of support in the Arab world. Without a genuine peace with Syria, Israel will never have peace with the Palestinians; there will always be bloodshed. By making a true friend of Syria, the U.S. can put all of these things on the table and perhaps negate them. All it would take is the return of the Golan Heights and a few billion dollars a year in aid. For Obama, this is the bargain of the century. The current investment in Israel has returned only thirty years of settlement expansion and failed peace efforts. It has raised a generation of Israelis who feel entitled to American aid and who balk at American influence. If the U.S. had continued to alienate the Syrian regime, that could have increased the likelihood of an emergence of domestic tensions, notably among the Kurds and the Muslim Brotherhood. We have all seen the effects of such domestic tensions in Iraq. The U.S. cannot find a substitute for Bashar Assad’s regime. Unlike the case with Iraq, it is difficult to identify a prominent Syrian opponent to the Syrian leader, inside or outside of the country. The new Assad has proven himself to be a man of principle making the best of a difficult agenda. His approach to negotiations with Israel is correct. Assad’s argument all along has been that the only way you can really get a systematic peace process going now is bringing in America to broker it. And the American role would be very important. It’s a tremendous challenge for the Obama administration diplomatically: nurse an agreement over the Golan Heights, which everybody seems to want, and use that to start talking about regional peace. And that would mean bringing Iran into the process while holding off the Israelis. The Israelis are interested in a Golan Heights settlement because they see a settlement with Syria over the Golan Heights as an issue that would isolate the Iranians from the Syrians and, therefore, give the Israelis more leverage to go after Iran, if they choose to do so, if they view Iran as a strategic threat. They don’t view the Palestinian issue, whether Hamas or Fatah, as a strategic issue. The Israelis see it as a tactical issue. The problem for Israel is that the Syrians have a different motive for dealing with it. They’re not interested in walking away from the Iranian agreement. If the Obama administration can get into a possible settlement of the Golan Heights dispute, land for peace, we can get a regional peace process going. And then the United States would have to also accept the idea that Iran should participate. Richard Holbrooke recently talked about the inevitability of having Iran involved, because for the United States, you have to look at the idea of having Syria, Turkey and Iran all together, all border countries playing an enormous role in making sure that the Iraqis — as we walk out of Iraq, and making sure that that happens safely— have a lot to say about what’s going to happen inside Iraq. They can be moderating influences. Therefore, we can see the potential for an enormous sort of a change in the paradigm. President Obama is looking for partners for peace in the Middle East. It takes brilliant and courageous leaders to make bold and decisive decisions; Israel has lacked those leaders due to corruption and a total disregard for the safety and peaceful existence of the Jewish state. For decades, Israel has been able to indulge their greed for Arab land and their greed for American support at the same time. Now the time has arrived in which they will have to choose one and let go of the other. It still seems a good deal. Better be careful not to lose both. The writer is professor of interdisciplinary studies at the University of Toledo. Syrian President dissolves the Office of National Security (Maktab al-`amn al-qawmi) and replaces it with a National Security Council (Majlis al-`amn al-watani). The Office of National Security is appointed by the REgional Command of hte Baath Party. The new body will be civilian and subject to the regular laws of government employment. We must wait to see if the President will establish the new body under his office as president or under his office as leader of the Regional Command of the Baath Party. In theory, if he reestablishes the body under his authority as president and not as head of the Baath Party, the authority of the Baath Party will be diminished. علمت ( كلنا شركاء) أن السيد الرئيس بشار الأسد قد أصدر مرسوماً ذي الرقم 36 لم يعمم , يقضي بإلغاء مكتب الأمن القومي واستبداله بمجلس للأمن الوطني من مهماته رسم السياسات الأمنية في سورية. وجاء في المرسوم ان العاملين في هذا المجلس هم عمال مدنيون يتم توظيفهم وفق قانون العاملين الموحد وهو القانون الذي يخضع له كل العاملون في المؤسسات والشركات والإدارات المملوكة من الحكومة , ويرأس حالياً مكتب الأمن القومي الذي هو احد مكاتب القيادة القطرية لحزب البعث الحاكم في سورية الرفيق اللواء هشام اختيار الذي اختير لهذا المنصب في المؤتمر القطري الاخير الذي عقد في حزيران 2005 , وكان يرأسه قبل ذلك الرفيق محمد سعيد بختيان والذي تم ترفيعه ليصبح نائباً لرئيس حزب البعث في نفس المؤتمر . والقيادة القطرية تضم 14 عضو وهي أعلى هيئة قيادية تدير سياسة حزب البعث الحاكم في سورية وتجتمع اسبوعيا لاتخاذ القرارات في المواضيع المطروحة مرتين : المرة الأولى يوم الثلاثاء وهو اجتماع مكاتب القيادة ويطلق عليه اسم اجتماع ” متفرغون ” ويوم الاربعاء وهو لكل اعضاء القيادة القطرية ما عدا السيد الرئيس الذي نادراً ما يحضر واذا ما قرر الحضور فانه يطلب اعضاء القيادة جميعاً للحضور للاجتماع به في القصر الجمهوري ، بينما مكتب الامن القومي يجتمع أسبوعيا في مقره الكائن مقابل منزل السفير الأميركي وذلك على مستوى قادة الاجهزة الامنية الأربعة مع رئيس المكتب وذلك للتنسيق فيما بينها بالمسائل الامنية اضافة لرفع التوصيات المتعلقة بالقضايا الامنية على مستوى البلد وبكل السياسات الداخلية والخارجية المتعلقة بالأمن القومي ورفعها للسيد الرئيس لاقرارها . ولم يتبين حتى الساعة الطريقة التي سينفذ بها المرسوم والآلية التي ستتبع لإدارته واختيار عناصره ولكن من الواضح ان هناك رغبة في توسيع قاعدة المشاركة في صياغة القرارات المتعلقة بالامن القومي بدل ان تكون مرتبطة بمجموعة ضباط لتتوسع وتضم مدنيين ذووخبرات يعرفون العالم ويحسنون الحديث بلغته ! وخصوصا ان القانون يعتبر ان ادارة امن الدولة تتبع لحزب البعث ويتم استخدام مكتب الامن القومي لدراسة جميع المرشحين لشغل كل وظائف الدولة من الصغير للكبير يعني من الآذن والفراش الى رئيس الوزراء حيث ترسل القيادة القطرية اسماء المرشحين لشغل الوظائف له ليعيدها مع تقييمات الاجهزة الامنية لكل الاسماء وبهذه الطريقة تقوم القيادة القطرية بتقييم ومن ثم تعيين شاغلي الوظائف العامة . Injured Liberty crewmembers are escorted to a memorial service on the deck of the aircraft carrier America on June 10, 1967. The Untold Story of Israel’s Deadly 1967 Assault on a U.S. Spy Ship ….. The record of the Navy’s civilian and military leadership was less inspiring. Though privately furious, U.S. officials lied about the nature of the Liberty’s mission and, Scott writes, were so eager to avoid stirring up public anger toward Israel that at one point they contemplated scuttling the ship to prevent news organizations from photographing the damage. Adm. John McCain, Jr., the father of the Arizona senator and 2008 presidential candidate, comes in for especially sharp criticism. As the head of the Navy’s inquiry, Scott writes, McCain understood that a “report critical of Israel would trigger diplomatic ramifications for the State Department and create domestic political trouble for the beleaguered White House, which now wanted to deemphasize the attack.” As a consequence, he contends, McCain barred his investigators from traveling to Israel to interview the attackers and allowed only a week to complete the probe, “less time than it took to bury some of the dead.” …..
Scott cites transcripts of conversations between the Israeli pilots and air controllers in Tel Aviv to show that at least some Israeli commanders were aware of the Liberty’s identity before the attack. He also shows that many U.S. officials — including then-CIA director Richard Helms — were privately scornful of Israel’s explanation. Some believed the attack may have been ordered by a battlefield commander who feared that Israel’s combat orders, if detected by the Liberty, might somehow leak to the Arabs. Scott clearly has his own suspicions, though he produces no smoking-gun evidence to support the charge of a deliberate attack, perhaps because none exists. In that sense, his book is likely to disappoint the conspiracy theorists as much as it angers proponents of the “fog of war” defense offered by Israel. But Scott is wise to leave the speculating to others. The story is shocking enough as it is. What is Syria’sposition on iran nuclear weapons program? Damascus, July 12 : French Foreign Minister Bernard Kouchner, speaking to reporters from Damascus Sunday, admitted that France and Syria were ‘not in full agreement’ on Iran’s nuclear programme. Perhaps the Palestinians and the Syrians should have a “secret manual” and training to get help educate their spokespeople too? Syria’s line on Iranian nuclear development is that it is Iran’s right to develop nuclear power and that it wants it to better negotiate but is not crazy. Non-officially, Syria is delighted with Iran’s nuclear development because it has given Syria political leverage it would not otherwise have. Many Syrians figure that Olmert would not have begun negotiations with Syria had it not been for Iran’s nuclear program. Olmert was trying to gauge Israel’s ability to “flip” Syria. Of course, Hizbullah is also an important ally. Olmert was also trying to see what Syria’s price was for abandoning Hizbullah after Olmert failed to kill Nasrallah and crush Hizb during the 2006 summer war in Lebanon. But Hizb would not be as scary were it not for Iran’s military abilities. See this article about how the US is offering the IAEA an 8% increase in money if it presses the Syria case, among other things. The Arab countries should offer IAEA on an 100% increase in money if they lift the Israel case on table. It is self-deception if USA in earnest believes that the problem is solved if Iran doesn’t become “nuclear” and the west continues to pretend that Israel is not a nuclear power. All major powers in the region will continue their efforts in secret to balance the situation by creating countermeasures to neutralize Israel’s supremacy. I suppose the west’s fierce resistance against Iran’s nuclear efforts are more concentrated to keep Iran from developing industrially than to the real fear of a few extra nukes. A really developed oil producer country is not in the “west’s” interests. Iran has clearly shown during the last decade that it wants to create own technological “independence” by investing much in education and enlarging its industrial capacities. With its over 70 millions population and wast resources Iran could become Middle East’s Germany (present days Germany) in a couple of decades. When Saddam made a giant economical and industrial “jump” in the 70’s and beginning of 80’s his (= Iraq’s) problems started. اعرب الرئيس الاميركي باراك أوباما عن استعداده للالتزام مع سوريا، وقال في مقابلة مع شبكة “سكاي نيوز” التلفزيونية الأمريكية تبث اليوم الأحد . ” أنا مستعد لقبول دعوة لزيارة العاصمة السورية وعقد لقاء مع الرئيس بشار الاسد ” . واضاف اوباما في المقابلة التي سجلت بينما كان يقوم بزيارة الى غانا، “بدأنا نشهد بعض الاتصالات الدبلوماسية بين الولايات المتحدة وسوريا “. ونعتقد ان سوريا تستطيع الاضطلاع بدور بناء حول عدد كبير من المسائل”. وكان الرئيس بشار الأسد قد دعا في مقابلة مع شبكة سكاي نيوز البريطانية ، الرئيس الاميركي باراك اوباما لزيارة سوريا، وقال الرئيس الاسد في تلك المقابلة “ان الولايات المتحدة تضطلع بدور خاص باعتبارها القوة الرئيسية (في العالم). اعتقد انه على الرئيس باراك اوباما ان يزور اكبر عدد ممكن من الدول لاجراء حواراته. وبالطبع فان ذلك يشمل سوريا”.واضاف الرئيس الأسد : “اننا بالتأكيد نرحب به في سوريا. وانا واضح جدا بهذا الخصوص”. What Iran always said is that it wants nuclear technology not nuclear weapons , the same technology that Germany and Japan have and alloyed to have , and that is it’s right under international law. This one for you American Jews , Christians and Muslims standing together against bigotry and racism by Christian fundamentalists. نظم أميركيون مسلمون ومسيحيون ويهود احتجاجات أمام مقر كنيسة أميركية وضعت لافتة معادية للإسلام، وطالبت منظمة إسلامية أميركية بمنحها الفرصة للحديث عن الإسلام في الكنيسة. جاء ذلك بعدما أقدمت كنيسة بمدينة غينسفيل بولاية فلوريدا على رفع لافتة كتبت عليها عبارة “الإسلام من الشيطان” في موقع بارز أمام مقرها. وفي تصريح لمحطة “أي.بي.سي 20” الإذاعية، قال تيري جونز راعي مركز اليمامة للتواصل العالمي الذي وضع اللافتة إن هذه الخطوة جاءت بسبب “نمو هائل للإسلام في الوقت الحالي، وهو دين عنيف وعدواني ولا علاقة بينه وبين الحقيقة الموجودة في الكتاب المقدس”. وردا على هذا الموقف تجمع عدد من الأميركيين احتجاجا أمام مقر الكنيسة يوم الأربعاء الماضي رفعوا خلاله شعارات تطالب بالاحترام المتبادل بين الأديان ولافتات تحض على التسامح الديني. ورفع الناشط اليهودي دينس شومان الذي قاد الاحتجاجات لافتة تقول “إله واحد.. طرق متعددة.. احترم دين جيرانك وأنت تمارس دينك”، وقد وضع في اللوحة العديد من رموز الأديان مثل الهلال والصليب والنجمة اليهودية ورموزا دينية أخرى. ورفع محتج ثالث لافتة تقول “تواصل بذراعين مفتوحتين وليس بعقل مغلق”، في إشارة إلى اسم الكنيسة “مركز التواصل”، في حين رفعت محتجة أخرى لافتة تقول “أنا أحب المسيح”. وقال شومان في بيان تلاه خلال الاحتجاجات “أولا أريد أن أعتذر لإخواني وأخواتي المسلمين على اضطرارهم رؤية هذا القدر المتواصل من عدم الاحترام للتقاليد الروحية”، مشيرا إلى أن كنيسة غينسفيل لو وضعت لافتة تقول “اليهودية من الشيطان” لأزيلت خلال 24 ساعة. من جانبه طالب مجلس العلاقات الإسلامية الأميركية (كير) بولاية فلوريدا بالسماح لأحد ممثلي المجلس بالحديث عن الإسلام في الكنيسة. وقال مدير مكتب كير في تمبا بولاية فلوريدا رمزي كيليتش إن الأبحاث أظهرت أن انخفاض الوعي وعدم المعرفة الحقيقية بالإسلام تعتبر السبب الرئيسي وراء المواقف المعادية للإسلام والمسلمين. وأعرب كيليتش في بيان رسمي عن أمله في تبديد المفاهيم الخاطئة عن الإسلام والمسلمين الأميركيين عبر الحديث لرعايا الكنيسة التي رفعت اللافتة. FOX: “To sort of bring it all home…” I guess their reporters are now even-more educated than the “Back to you guys” ones of a few years ago. You know, I’d love to have Akbar be my consumer. He’s the ultimate shopper – if it looks good, if it sounds good, he’ll buy it. A: I’m a suicide bomber. After receiving the equipment, the training, the instructions and the directions, I pack up, I record my last farewell, and I’m ready to go. One late night, as I approach the particular wadi I had observed and trained to cross so many times before, lo and behold I discover that neither I nor my “controller’s” intelligence was good. Suddenly, out of nowhere, a huge Berlin Wall appears in my way, and I simply cannot cross over. Disappointed, I go back home, call up my “boss”, and tell him that I’ve failed. I will not be doing this again. B. I’m a suicide bomber. My mission has been carefully planned by quite a few people involved. Where and how I cross over, and what I do once I’m in, have all been planned out. Contingencies are in place. If a sudden fence “appears” out of nowhere, there’s ample space around it. On the other side, a collaborator or two are ready for their part (usually driving the suicide bomber to his target, normally inside one of the major cities in Israel, far away from the “fence”.) But despite all the preparation and intelligence gathering, I still run into a Wall (ouch!) Do I give up? Or do I walk, or get my friend to drive me down 5 kilometers, to where there is no Wall? Or do I try another day or night? Yossi, there are real people, in the real flesh and blood, who really believe that “the fence” (Berlin Wall) has stopped suicide bombers. There are infrared videos, showing suicide-bombers appearing in the middle of the night, coming all the way to the wall, and turning around disappointed. There are even fine audio sensors that record those bombers as they walk away saying things like “Damn it! Again a wall! Forget it, I’ve had enough of this!” It’s working. After all, (Indisputable FOX quote): “since the wall has been erected, there are far LESS suicide bombings…” You’d be an idiot not to realize the direct link between the two. of the west bank Arabs. I was looking for this (TV report) on the Internet for a long time..!! Sorry.. PBS it shoud be.. Thanks for the article, I ran it through Google translator (amazing on-line software). I am glad there were protests against this church and I am glad there were Jews involved as well. That being said, the Arab government controlled media is overtly anti-semitic and racist and there are no demonstrations against it. Yossi, there are real people, in the real flesh and blood, who really believe that “the fence” (Berlin Wall) has stopped suicide bombers. And there are real people, in the real flesh and blood, who really believe that “the fence” (Berlin Wall) “limits the ability of the resistance to arrive deep within [Israeli territory] to carry out suicide bombing attacks”. In his November 2006 interview with Al-Manar TV, Palestinian Islamic Jihad leader Ramadan Salah claimed that the barrier is an important obstacle, and that “if it weren’t there, the situation would be entirely different.” In a March 23, 2008 interview, Palestinian Islamic Jihad leader Ramadan Abdallah Shalah complained to the Qatari newspaper Al-Sharq that his organization had been forced to switch from martyrdom missions to rocket attacks because the separation barrier “limits the ability of the resistance to arrive deep within [Israeli territory] to carry out suicide bombing attacks, but the resistance has not surrendered or become helpless, and is looking for other ways to cope with the requirements of every stage” of the intifada. I recognize that in the past few days some of my comments have been exhausting. I’ve felt that as well. I wish I didn’t feel the need to write them. But it drives me nuts seeing how Neocon ideology is still trying to sell their old inventory. Jihadist organizations, Security-Fences, Existential-Threat, etc. They all have one intention, and one intention only – to speak to people’s fear and emotions, not to their rationale. Because when we’re afraid, perhaps even paranoid, last thing we’ll do is question a failing policy. It’s still difficult for me to sit quietly while observing these attempts to subdue the human mind, and to perpetuate the kind of divisive mentality that is more reminiscent of the Middle Ages, than of a better future in this 21st century. Seems Shai that also others in Israel (some of you few realists) are worried. Bradley Burston: Will Israel grant asylum to fascism? In other words, if doctors or nurses abide by their professional oaths and administer medical treatment to a refugee lacking permits to stay in Israel, their prison sentence could be the same as that of the refugee – five, seven, even 20 years. This is the way fascism begins, not with a bang, but with a Knesset vote. Do not Shai give water or bread to an African refugee or you will be sent for years to “a retraining centre” to learn again the core values of Zionism. I must say that the present Israeli government coalition is doing excellent job. In less than halve a year they have managed to reveal the real face of Israel and taken a huge (even it is unintended) step towards peace. Now when Solana has demanded UN to establish the Palestinian state even if Israel doesn’t “allow” that, Lieberman (the best soldier Palestinians ever had) is suddenly worried about the legitimacy of Abbas. Lieberman obviously just did read that Hamas did win the elections and Abbas presidency term ended halve year ago. Funny how Israeli politicians have kept up the PA’s “legitimacy” for a couple years now when the end game is closing are denying their of “partners” legitimacy. You have real windmills in Israel as politicians. Israel’s fear of losing “center stage to Syria/Arabs” and its role as “the puppeteer” is the subject of a review by desertpeace under the title, ‘Israeli thought Police Declare all out war om the web’. Darn. Those “thought police” have yet to contact me. I should be getting some of $150,000. Akbar, you should ask one of the wonderful Israeli contributors here who probably can tell you how to be paid to leave pro-Israel comments and to vote 8 times “Syria did it and the President knew” in our “who killed Hariri” poll. Hint: His love for voting is consistent with the way he lectures us Syrians about the beauty of Democracy. Before I ask you who voted 8 times and how much money he received from the GOI, can you tell me if any anti-Israeli voted more than once? Better yet, why don’t you print out the data for all of us to see? I am astonished to learn that some Palestinias are actually Jewish or of Jewish descent….Does this mean that we are really living in Israel!And that the Arabs simply refuse a real live truth!Thanks AP i will sleep tonight as a smarter guy. only once.. and wasn’t payed. If you didn’t watch yet the video I posted previously, you should. It’s interesting and is a followup to the debate about Zand’s book. I don’t care who votes and how, but to manage an online poll, an admin needs to make sure people are not cheating … or not cheating much at least. You do realize that specific names and their voting choices were never shared publicly. But I hope it is obvious that admins can see the data in any blog. A few people here tend to vote more than once (Syrians, and Israelis) … I don’t care to write to them … if one votes from his home computer and another time from his office, it is ok … I can assume at home his wife voted and at at the office he voted. But your Israeli friend who comes here to lecture Syrians about democracy will not stop voting apparently … 8 times so far and still going! You tell me what I should do? … Allow him to conclude that he can exercise (infinite times) his love of democratic voting (against Syria) every time we put up a new poll? Anyway, to conclude, yes your vote will be visible to the admin of this site, just like your email address you use to register is visible to the admin too. And we don’t care how you vote … we care how many times you vote. This is an online poll … it is not scientific, and no one will win or lose as a result. Let’s not give it too much weight… it is simply to give us a general idea how our readers see things. There’s no hope anymore. When the Israelis start stuffing very important internet ballot boxes you know the world is coming to an end. It all means that we are all mutts and we all have the same rights to live together as equal. By the way, I was told that I implied it was AIG who voted 8 times. It was not. ولكن وبإختصار : إن محنة اهالي قتل أوسجن أو نفي بسب التحزب لمصالح سعيد حوى الأخواني السوري هي أكبر وأفدح ممن لاقوا الأمر نفسه من الإخوان .. ولاغرابة في ذلك؟؟ ومن البداهة ان يحاول من هو في أزمة أن يحلها .. ومن البداهة لمدرسة دمشق المنطق الحيوي ان تعدها محنتها ومحنة وطن بأسره ولذلك كتبنا وأصدرنا البيانات وتعبنا وبح صوتنا في تحذير الجميع من ذلك المرض المعدي السعاري المستشري بما ليس له مثيل حتى في مرحلة الظلام العثماني ..
ما أود قوله لبقايا الإخوان وبكل صدق الأفضل لكم وللوطن وللحيوية الإسلامية السياسية هو حل التنظيم مرة واحدة والى الأبد ..
رداً على النقري وطلبه حل حزب الاخوان المسلمين !! قلّل الناشط الحقوقي والمحامي السوري هيثم المالح من أهمية التصريحات التي أدلى بها رئيس مكتب الإعداد والثقافة والإعلام في القيادة القطرية لحزب البعث العربي الاشتراكي الحاكم في سورية، الأستاذ في كلية العلوم السياسية بجامعة دمشق الدكتور هيثم سطايحي، بشأن علاقة حزب البعث بالسلطة وقانون الأحزاب المرتقب؟ وأكد الناشط الحقوقي أنّ تلك مجرد “تصريحات نظرية لا علاقة لها بالواقع” الذي قال بأن حزب البعث لا دور له فيه على الإطلاق. وأشار المحامي هيثم المالح، في تصريحات خاصة لـ “قدس برس”، إلى أنّ من يحكم سورية ليس هو حزب البعث وإنما “جهات أمنية مجهولة”. وقال المالح “حزب البعث لم يعد له وجود في سورية، وهو لا يعدو كونه واجهة سياسية سقطت شعاراتها بالكامل، فبدل الوحدة هناك تشرذم وبدل الحرية السجون مليئة بأصحاب الرأي وبدل الاشتراكية هناك اقطاعية الدولة”، حسب تعبيره. This is another important article explain how Syrians are thinking for their role in the future as a connector node in energy/power/commercial between Africa, Asia and Europe. من خلال المنتديات الاقتصادية الأخيرة بين رجال أعمال سوريين وآخرين أجانب التي افتتحها الرئيس بشار الأسد مع نظرائه من القادة، يبدو بوضوح أن هناك «رؤية استراتيجية» مفتاحها تحويل سورية إلى «عقدة ربط» في مجالات الغاز والنفط والنقل بأنواعه بين الشرق والغرب وبين الجنوب والشمال. بمعنى آخر، تسعى سورية إلى «تموضع استراتيجي» لتكون ممراً ومعبراً بين البحورالأربعة: الخليج العربي، الأبيض المتوسط، قزوين، والأسود، إضافة إلى البحر الأحمر وربما يكون السر في ذلك، هو اتباع دمشق سياسة حكيمة بالتوازن بين فرقاء إقليميين. فالرئيس الأسد زار النمسا وسلوفاكيا، كما إنه استقبل في دمشق الرئيسين اليوناني كارلوس بابولياس والتركي عبدالله غل اللذين يحملان موقفين مختلفين إزاء قبرص. وأعلن الأسد بعد لقائه بابولياس في دمشق أن المحادثات تناولت «القضية القبرصية وأعربنا عن اهتمامنا البالغ بإيجاد حل لهذه المشكلة دعماً للجهود المبذولة للتوصل إلى حل يؤمن حقوق جميع الأطراف». وبعد أسابيع على زيارته ارمينيا، أجرى الرئيس السوري محادثات في باكو مع الرئيس الأذري إلهام علييف الذي يحمل بدوره وجهة نظر مختلفة عن الرئيس الأرمني سيرج سركسيان إزاء مسألة إقليم ناغورنو كاراباخ. وشدد الأسد في باكو على ضرورة حل القضية بـ «الحوار على أساس تطبيق قرارات الشرعية الدولية وبما يضمن حقوق جميع الأطراف»، معرباً عن استعداد سورية لـ «تقديم أي مساعدة تسهم في حل هذه المسألة انطلاقاً من علاقتها الجيدة مع الطرفين». لكن الجديد الذي قدمته «الزيارة التاريخية» للرئيس الأسد إلى باكو أن الرؤية الاستراتيجية انتقلت سريعاً من الفكر إلى التطبيق، وما على المؤسسات التنفيذية الحكومية ورجال الأعمال إلا مواكبة الخطوات التي وضعتها الزيارات الرئاسية الأخيرة إلى عواصم إقليمية ودولية والولوج من الأبواب التي شرعتها المؤسسات الرسمية التي تبدي استعدادها لمعالجة العقبات التي تعترض السير قدماً إلى المستقبل بدلاً من انتظاره. يعود الطرح السوري إلى بداية عام 2004، عندما افتتح الرئيس الأسد منتدى اقتصادياً سورياً – تركياً في استنبول، ذلك في أول زيارة يقوم بها رئيس سوري إلى تركيا خلال ستة عقود على الاستقلال. قال الأسد وقتذاك إن سورية «تقوم بعملية تطوير للبنية التحتية، وهي بلد واعد اقتصادياً»، وبالتالي فإن اتفاقية التجارة الحرة بين البلدين «ستفتح الباب واسعاً أمام تطوير العلاقات»، على أمل أن تصبح سورية «عقدة الربط» بين الشرق والغرب وبين تركيا والعالم العربي، خصوصاً في مجالي الغاز والطاقة. لا شك في أن الغزو الأميركي للعراق في عام 2003 والفوضى الأمنية فيه والتوترات الأخرى في الشرق الأوسط وحربي تموز 2006 وغزة 2009 ومحاولات إدارة الرئيس الأميركي السابق جورج بوش فرض عزلة على دمشق، غيرت من الأولويات السورية. كانت الأولوية للاستقرار الأمني والسياسي. لكن الانفتاح السوري-التركي استمر وتحولت الوعود التي أطلقت في زيارة الأسد بداية 2004 إلى واقع. أنجزت اتفاقية التجارة الحرة بين البلدين. وارتفع التبادل التجاري من 800 مليون دولار أميركي إلى بليوني دولار. الآن، انتهت مساعي العزل إلىالفشل. وجاءت إدارة أميركية جديدة تؤمن بالحوار مع سورية. وزار دمشق الرئيس الفرنسي نيكولا ساركوزي نهاية العام الماضي. كما إن الأسد شارك في قمة «عملية برشلونة: الاتحاد من أجل المتوسط». وتطورت العلاقات السياسية والدبلوماسية بين سورية والعراق. وراح معظم القادة الأوروبيين والأميركيين يقولون إن دور سورية «محوري» وإنها «مفتاح» السلام الشامل في الشرق الأوسط وإنه لايمكن تجاوز موقعها الأستراتيجي ولادورها في المنطقة. عادت «الرؤية الأستراتيجية» السورية إلى الحضور بقوة. لقد طرحت أولا خلال زيارة الرئيس الأسد إلى فيينا في أيار (مايو) الماضي، إذ قال إن النمسا «تقع في قلب أوربا تاريخياً وجغرافياً كموقع سورية في العالم العربي والذي يجعلها (سورية) منفذاً لدول الاتحاد الأوربي باتجاه أسواق البلدان العربية وبلدان غرب آسيا ومركزاً لإقامة استثمارات مشتركة في مجالات الطاقة والصناعة والتعدين والزراعة والمعلوماتية والاتصالات والمصارف والتمويل»، إضافة إلى جعل سورية «ممراً لعبور مصادر النفط والغاز من المنطقة العربية وآسيا إلى الأسواق الأوروبية عبر المتوسط وتركيا ونقطة التقاء لشبكات الربط الكهربائي بين هاتين المنطقتين في العالم من خلال موقعها الأساسي في مشروع الربط الكهربائي للمشرق العربي الذي يصل الشبكة الكهربائية العربية بتركيا وعبرها إلى أوروبا». وجرى التركيز أيضاً على ذلك خلال زيارة الرئيس غل إلى دمشق في منتصف أيار، إذ قال الرئيس السوري في مؤتمر مشترك لرجال الأعمال: «عندما نفكر لاحقاً بأن هذا الفضاء الاقتصادي سيتكامل فنحن نربط بين البحر المتوسط وما بين بحر قزوين والبحر الأسود والخليج العربي» ، مضيفاً: «نستطيع أن نتكامل في هذا المجال عندما نربط هذه البحور الأربعة ونصبح العقدة الإجبارية لكل هذا العالم في الاستثمار وفي النقل وغيره». وأعيد التأكيد على هذه الفكرة خلال المحادثات في أرمينيا. وبين هذه الزيارات والخطوات السياسية، اتخذت خطوة عملية في هذا السياق. إذ تم تشغيل خط لنقل البضائع عبر سكك الحديد بين ميناء أم القصر العراقي على الخليج العربي إلى ميناء اللاذقية السوري على البحر الأبيض المتوسط، ذلك بعد زيارة رئيس الوزراء السوري محمد ناجي عطري ووزير الخارجية وليد المعلم والحديث عن «اتفاق استراتيجي» في جميع المجالات. كما جرى الحديث عن إعادة تشغيل أنبوب النفط بين كركوك وبانياس بطاقة 200 ألف برميل يومياً وإقامة أنبوب جديد بطاقة تصل إلى 1.4 مليون برميل يومياً. وكان رئيس الوزراء العراقي نوري المالكي بحث مع رئيس اتحاد منتجي النفط والغاز في روسيا يوري شافرانيك في موضوع أنبوب النفط السوري-العراقي. وجرى تكليف شركة «ستروي ترانس غاز» الروسية بإجراء دراسة للأنبوب القائم. كما إن وزير الخارجية العراقي هوشيار زيباري قال لـ «الحياة: في دمشق إن بلاده طلبت من هذه الشركة درس الجدوى الاقتصادية ووضعية الأنبوب القديم: هل هو صالح أم يحتاج إلى تصليح أم بناء خط آخر في الوقت ذاته؟ وقال إن هذا المشروع استراتيجي ستستفيد منه الدول العربية. وتحدث زيباري أيضاً عن «مشروع كبير» يتمثل بربط حقل الغاز في عكاس الذي تبلغ طاقته 500 مليون قدم مكعب بالشبكة السورية. وفي هذا السياق، أضيف عنصر جديد. إذ إن المسؤولين اليونانيين أرادوا أن يكونوا جزءاً من هذا التصور. وبدا ذلك واضحاً خلال زيارة الرئيس بابولياس وحضور المنتدى الاقتصادي في الشهر الماضي. إذ قال لـ»الحياة» نائب وزير الخارجية تيدور ماكسيميس إن بلاده ترى أن سورية «قادرة على لعب دور نقطة التوزيع والوصل للبضاعة والتجارة بين المتوسط والخليج والدول المجاورة»، لافتاً إلى أن اليونان «هيأت بنية تحتية ضخمة» بحيث تكون قادرة على أن تكون حلقة ربط مع البحر الأسود والأدرياتيكي ودول البلقان حيث تعمل أربعة الآف شركة يونانية وروسيا ما يؤهلها لتصبح «بوابة سورية» إلى تلك المنطقة. ولدى الانتقال إلى أول زيارة يقوم بها الأسد إلى باكو منذ استقلال أذربيجان في عام 1991، خطت الرؤية الاستراتيجية خطوة كبيرة من التفكير والتخطيط إلى التنفيذ. ولم يكتف، في أن خرج الرئيس علييف عن التقليد الأذري عبر حضوره لأول مرة منتدى للقطاع الخاص بهدف التعبير عن «الإارادة السياسية» لتطوير التعاون، بل إن الجانبين اتخذا خطوات عملية في هذا السياق. أولى هذه الخطوات، أن البلدين وقعا نحو 19 اتفاقاً ومذكرة تفاهم لتعزيز التعاون في جميع المجالات الاقتصادية والسياسية والتجارية. وثانيها، أن البلدين اتفقا على تصدير نحو بليون متر مكعب من الغاز من بحر قزوين إلى سورية عبر تركيا التي باتت بمثابة «جسر» بين البلدين باعتبار أن الجانب السوري يعتبرها «شقيقا» والجانب الأذري يرى أن بلاده وتركيا فيها «شعب واحد في بلدين». ويقول لـ «الحياة: نائب رئيس الوزراء للشؤون الاقتصادية عبد الله الدردري إن الغاز سيصدر عبر الأراضي التركية ذلك أنه اتفق مع الجانب التركي على ربط شبكة الغاز التركية بالسورية بين موقعي كلس وحلب، التي تربط بدورها بـ «خط الغاز العربي» القادم من مصر. استراتيجياً، إذن يجري الحديث عن مشروع طموح. إذ علم أن البحث جار لوصل مشروع الغاز العربي القادم مصر إلى الأردن إلى مدينة حمص وسط سورية بـ «خط نابكو» الذي يمتد من أذربيجان إلى جورجيا وتركيا وبلغاريا ورومانيا والنمسا بطاقة تصل إلى نحو 31 بليون متر مكعب سنوياً وبكلفة تصل إلى نحو عشرة بلايين دولار أميركي، علماً أن إنتاج سورية من الغاز يبلغ 23 مليون متر مكعب سنوياً وسيصل إلى 35 مليوناً في العام المقبل. وعلم أن وزير النفط السوري سفيان علاو سيشارك في المؤتمر الوزاري الخاص بأنبوب «نابكو» المقرر عقده في أنقرة في 13 الجاري. وكان زيباري قال إن الاتحاد الأوروبي موّل دراسة بكلفة 50 مليون يورو لإعداد دراسة حول كيفية الاستفادة والاستثمار في حقل «عكاس» وهو مهم لأوروبا في الخط العربي للغاز. يشار إلى أن موسكو تعتقد أن مشروع «نابكو» يرمي إلى التخفيف من الاعتماد الأوروبي على الغاز الروسي. كما إن روسيا بصدد إقامة مشـاريع جـديدة للغاز بين البحر الأسود وبلغاريا بحيث يتفرع منها إلى فرعين ليمر في صربيا والمجر واليونان وسلوفـينيا ويـنتهي فـي النمـسا وإيـطاليا. وتقدر كلـفته بـأكثر مـن ثمـانية بلايين يورو، ذلك ليكون موازياً أو منافساً لـ»نابكو». ويعتقد الجانب السوري أن مشاريع أخرى ستؤسس بالتوازي مع خطوط الغاز خصوصاً ما يتعلق بالنقل بين الدول المعنية. إذ أكد الرئيس الأسد أمام رجال الأعمال السوري والأذريين على ضرورة «الربط الفيزيائي بين البنية التحتية لدول المنطقة بما يشكل شبكة متكاملة من أنابيب الغاز والسكك الحديدية والطرق والمرافئ التي تربط بين البحار الأبيض المتوسط والأسود وقزوين والخليج وحتى البحر الأحمر»، مضيفاً أنه «بناء على هذا الربط الفيزيائي والعلاقات المميزة بين سورية وكل من تركيا وأذربيجان وإيران والعراق ودول مجلس التعاون الخليجي، فإن الاتفاقيات الثنائية والمتعددة بتبادل السلع والخدمات وخصوصاً الطاقة أصبحت ممكنة». عليه، بالإمكان الانطلاق من البنية التحتية التي أسست بين سورية وكل من هذه الدول عبر توقيع اتفاقات ثنائية، إلى «بنية تحتية إقليمية» ما يسمح بتعزيز موقع كل طرف وتبادل الاستثمارات في البنى التحتية للآخر. فسورية، مثلاً تنوي استثمار 50 بليون دولارأميركي لتطوير بنيتها التحتية حتى عام 2015. كما إن إجمالي الاستثمارات المطلوبة تبلغ 132 بليون دولار (بينها 77 بليوناً من القطاع الخاص) لتحقيق معدل نمو قدره 8 في المئة وفق الخطط الحكومية الحالية. في المقابل، تبلغ قيمة الناتج القومي لأذربيجان 74 بليون دولار أميركي لنحو ثمانية ملايين أذري. وهي تملك احتياطياً كبيراً من النفط والغاز، ذلك أنها بعد نيل الاستقلال وقعت شركة النفط الحكومية في 1994 اتفاقاً مع 13 شركة دولية وأميركية بينها أرامكو وأكسون كي تنقب أكثر في الآبار النفطية في قزوين، أعمق مما كانت وصلت إليه الشركات السوفيتية. وفي 2006، بدأ تشغيل أنبوب نفط من هذه الآبار في باكو إلى تبليسي (العاصمة الجورجية) إلى ميناء جيهان التركي، بطاقة تصل إلى 50 بليون طن من النفط الخام سنوياً. كما جرى مد أنبوب آخر للغاز مواز له بطاقة تصل إلى 296 بليون متر مكعب سنوياً ليصل إلى السوق الأوروبية. وبحسب المصدر الأذري، ساهم تشغيل أنبوبي النفط والغاز إلى تحقيق معدل نمو قدره 31 في المئة في عام 2006 ورفع حصة النفط من العائدات إلى 59 في المئة من الواردات الإجمالية. كما أسس الرئيس الراحل حيدر علييف «صندوق النفط الحكومي» لدعم الاستثمارات في القطاعات الأخرى، ووصلت موازنته إلى بليوني دولار. ويتوقع أن تصل في عهد الرئيس الحالي الهام علييف إلى 36 بليوناً في العام المقبل، تصرف في استثمارات على التعليم والاقتصاد والبنية التحتية. هذا أحد الأدلة الملموسة على إمكانات التكامل بين الدول الواقعة بين البحور الأربعة. وكان الأسد قال في باكو: «عندما نتطور بشكل إفرادي فستكون هناك مشكلة لأننا سنكون محل أطماع وعندما لا نتطور فستكون أيضاً هناك مشكلة لأن عدم التطوير يعني عدم الاستقرار، لكن عندما نتطور كلنا كدول وفي نفس الوقت مع بعضنا من خلال مصالح مشتركة فسنكون أقوياء». Actually i think norman (like most israelis! )that we should live together as equal it is the arabs that refused in 1948 and still today;that we Israel be equal! !and equal Norman means equal rights!And Israel is our human right.And it is only justice that israel exists for this is the origin of this land!!! !way before islam or christiniaty…and no we will not be converted by force like some Palestinians! Do you think that the Hebrew should lose their right to return if they change their religion?. No but i fail to see the connection between loosing ones religion and converting people by the sword? Is it not possible that the local inhabitant who are Christians and Muslims , were at one time Jewish , and they should have the same right that you and others who stayed Jewish to stay in Israel.